Surface classes allow various properties (e.g. Absorptive, Transparent) to be applied to surfaces, which can affect specified molecules. 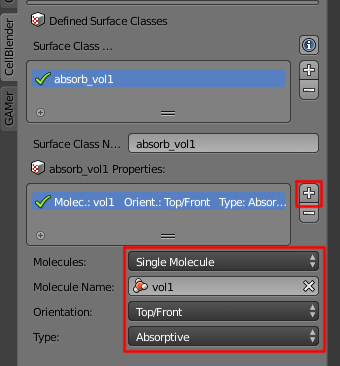 Later, in the Surface Classes and Reactions section, we will also see how surface classes can also be used to specify absolute orientation in reactions. In this section, we will create a Plane object that sits inside a Cube object. 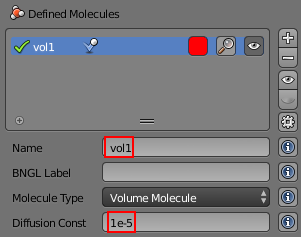 The Cube object will be filled with vol1 molecules. The Plane object will have a surface class that is Absorptive to vol1 molecules. The project directory is set to be wherever the current blend file is saved. 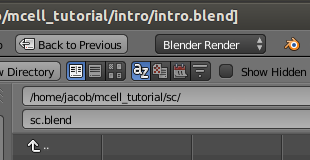 Let's save the file right now by hitting Ctrl-s, typing ~/mcell_tutorial/sc (or C:\mcell_tutorial\sc on Windows) into the directory field, sc.blend into the file name field, and hit the Save As Blender File button. Hit the Model Objects button. 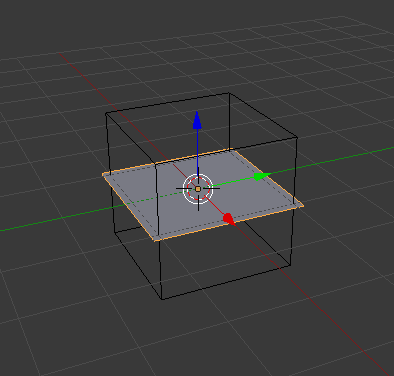 Hit the Cube button and then hit the + button to add it to the Model Objects list. 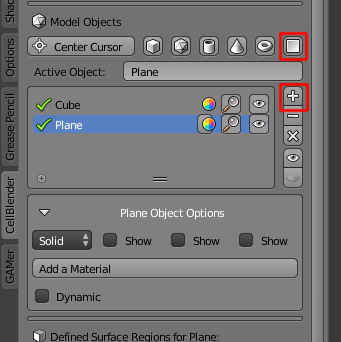 Under the Cube Object Options panel, select Wire from the drop-down menu. 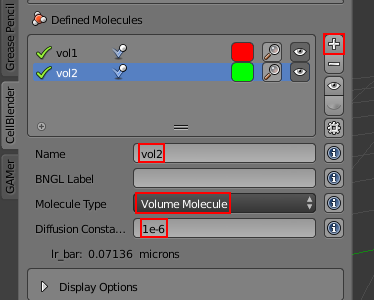 Add a volume molecule named vol1 with a diffusion constant of 1e-5. Set the Site Name to vol1_rel. Set the Release Shape to Object/Region. 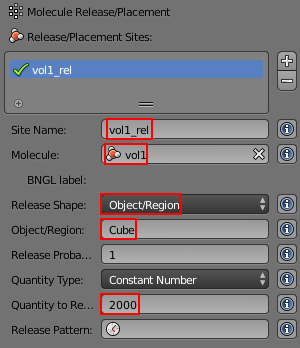 Set the Object/Region to Cube. Set the Quantity to Release to 2000. Hit the Model Objects button and then the Plane button. You should now have a plane going through the middle of your cube. With the cursor in the 3D View Window, hit s, then 1.1 to specify the scaling factor, and Enter to confirm. Hit the + button to actually add it to the Model Objects list. Hit the Surface Classes button. 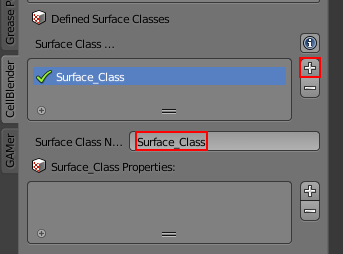 Hit the + button to create a new surface class called Surface_Class. Hit the + button beside the empty absorb_vol1 Properties list. Select Single Molecule from the Molecules field. Select vol1 from the Molecule Name field. Set the Orientation to Top/Front. Set the Type to Absorptive. This causes any vol1 molecules that touch the FRONT of a surface with the absorb_vol1 surface class to be destroyed. Now that we have created our surface class, we need to assign it to our mesh. 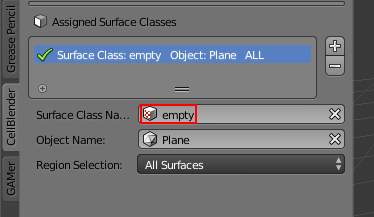 Hit the Assign Surface Classes button. Hit the + to begin modifying a surface region. 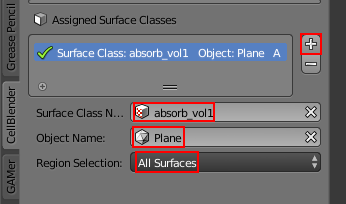 In the Surface Class Name field, select absorb_vol1. Under Object Name, select the newly created Plane object. Leave Region Selection set to All Surfaces. absorb_vol1 is now assigned to all of the Plane object. In this example, we are assigning the surface class to every face of Plane, but that is not always the case. Save the Blender file (Ctrl-s). Hit the Run Simulation button and then the Export & Run button. Once the simulation has finished running, hit Reload Visualization Data button. See if you can notice the vol1 molecules being destroyed by the absorptive surface. To reiterate what was said previously, the command above creates a surface class called absorb_vol1. Since vol1 is the value set to the ABSORPTIVE command, this means that any vol1 molecules that touch the FRONT of a surface that has the absorb_vol1 surface class will be destroyed. Once again, to reiterate, this assigns absorb_vol1 to all of the Plane. That's all there is to it. The other two surface class commands are REFLECTIVE (the default state for surfaces) and TRANSPARENT (allows molecules to freely pass through). Feel free to try these out on your own. In the Surface Classes and Volume Molecules section, we learned that surface classes can be used to give meshes special properties. Surface classes can also be used to provide extra specificity over how reactions occur. We'll pick up right where we left off at the end of Assign the Surface Class. In fact, the instructions will be very similar, aside from a few minor changes. First, we will create a new project based off of the existing sc.blend project. From the File menu, select the Save As option. Change the directory field to /home/user/mcell_tutorial/sc_rxn where user is your user name. Click to confirm when it asks if you want to create a new directory. 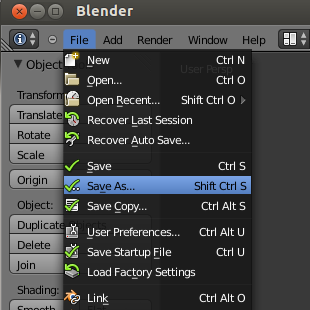 Change the blend file name to sc_rxn.blend and click Save As Blender File. Change the Name to vol2. Change the Diffusion Constant to 1e-6. Hit the - button under absorb_vol1 Properties to remove the existing properties. 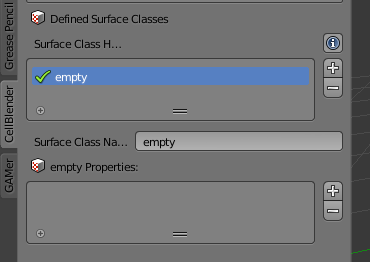 This modified surface class, empty, is the simplest case you can have for a surface class. By itself, it's not very useful, but we can use it in reactions to specify absolute directionality. Now that we have modified our surface class, we need to reassign it to our mesh. Under the Name field, select empty. You should be able to leave everything else as is. Change Reactants to vol1, @ empty'. Change Forward Rate to 1e7. Once the simulation has finished running, hit the Reload Visualization Data. Hit Alt-a to begin playing back the animation. You may need to change the color of vol2, so you can tell it apart from vol1. Once you have done that, you should notice that there are vol2 molecules being created inside the box, but only in the upper portion of it, despite the fact that the vol1 molecules exist on both sides of the plane. The reason for this is because only the vol1 on the BACK of the empty surface class are considered possible reactants.